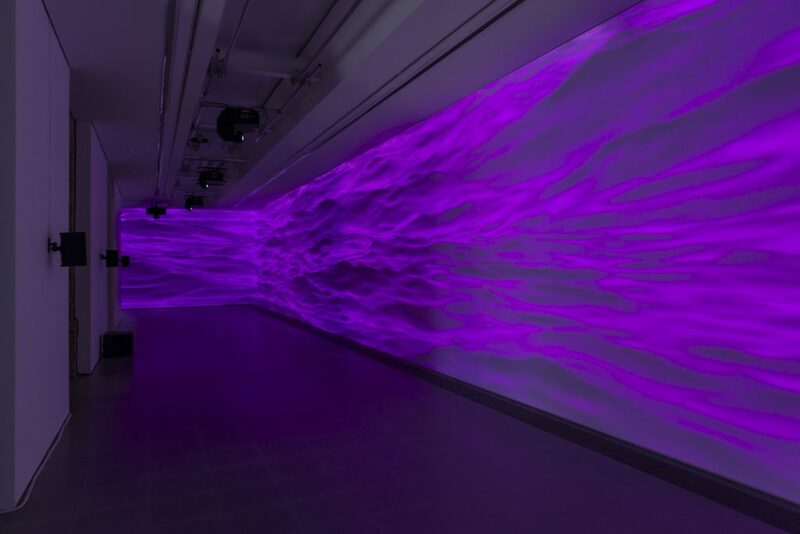 Spanning the outer walls of the gallery, undulating purple ocean waves morph into shifting scenes from J.M.W Turner’s Slave Ship (Slavers Throwing Overboard the Dead and Dying, Typhoon Coming On), 1840. The original painting depicts the murder of 133 slaves on the British slaving vessel Zong, in which the captain ordered the “cargo” thrown overboard to collect insurance. 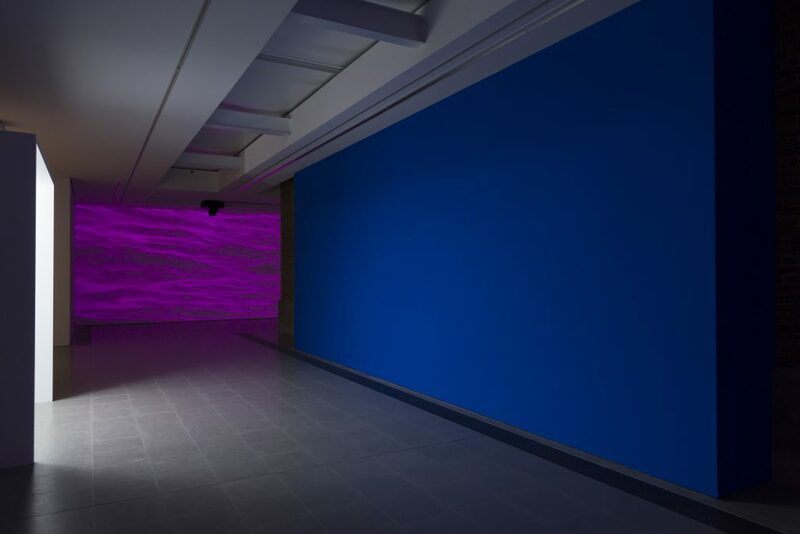 To create this immersive environment, Perry utilized the Ocean Modifier function on Blender.3 The waves are purple because this is Blender’s way of indicating that something is missing—Perry has stripped away everything but the texture of the waves as if to accentuate the loss of Black life at the hands of systematic racism throughout history. Encoded and digitally rendered, Black loss becomes all-encompassing of vision. The viewer must walk through this visual space of loss and experience it bodily. 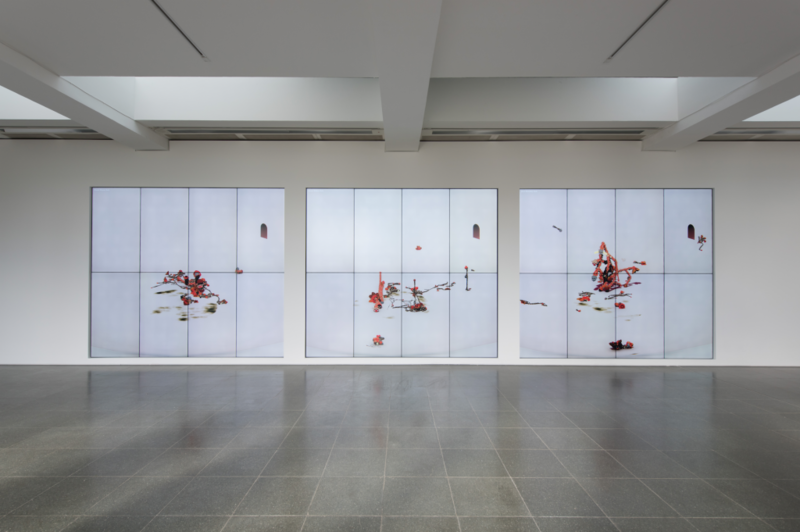 Sondra Perry, Installation view, ‘Graft and Ash for a Three Monitor Workstation’ in Typhoon coming on, Serpentine Sackler Gallery, London (6 March – 20 May 2018) © 2018 Mike Din. Sondra Perry, Graft and Ash for a Three Monitor Workstation (Still), 2016. Courtesy of the artist. 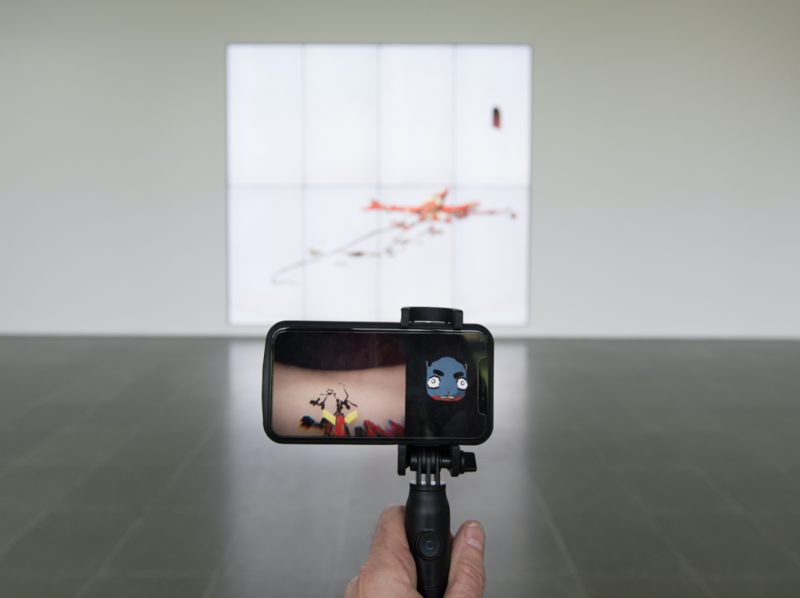 Across the long water, Ian Cheng’s exhibition in the Serpentine Gallery is utterly different yet involves a different kind of online life. On view for the first time is a brand new model for digital life called BOB, which stands for Bags of Belief. 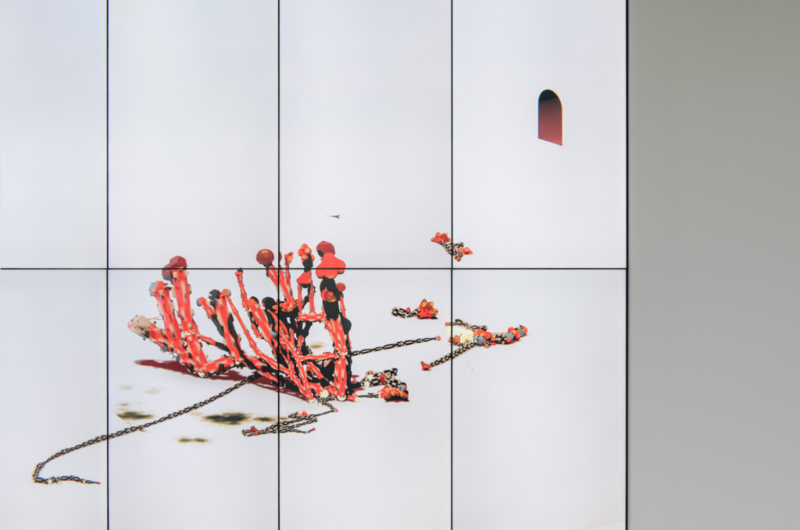 Ian Cheng, Installation view, Serpentine Gallery, London (6 March – 28 May 2018) © 2018 Hugo Glendinning. On six different multi-screen displays, a litter of six iterations of the BOB program was born on the morning of my visit to the gallery. Each BOB runs a unique personality module, so that each has its own temperament and preferences. Looking like a cross-section between a snake, a dragon and an otter,7 BOB slithers, crawls, and darts around his digital cage. Walking through the gallery, the viewer has the uncanny feeling of looking at animals behind bars. BOB is different from other AI’s because his conception is based on the idea of having a body. Each BOB grows and changes over time, developing distinct physical characteristics. In order to survive, he must eat.8 This feeding is not just symbolic: BOB has a coded metabolism, which has an effect on how he grows and also (like many of us) on his mood. But, BOB’s most gripping and unique feature is that he learns from the viewer. A special smartphone apparatus connects BOB to the user, where his lovable cartoon face appears on the phone screen next to a live feed of what BOB can see through his eyes. Because the phones utilize facial recognition technology, the user can make faces at BOB to effectively teach him different emotions. BOB can periodically sense and remember moments across 20-25 different parameters. 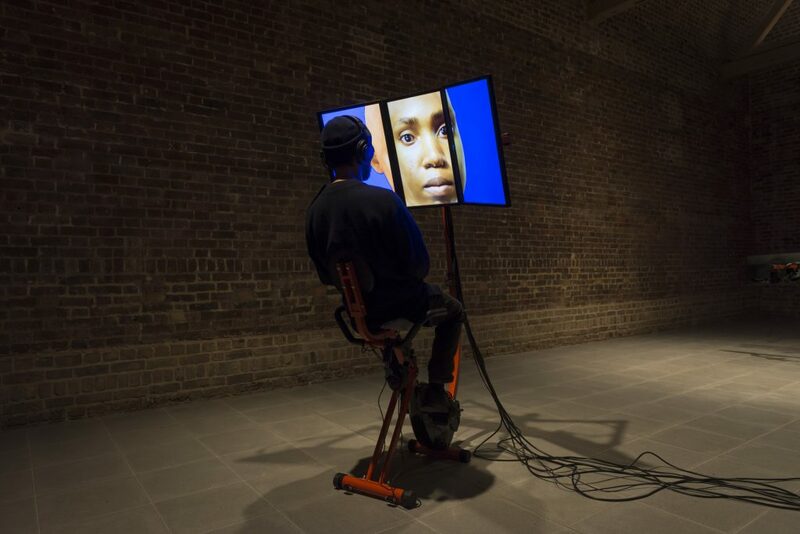 In every interaction with him the viewer has a chance to become imprinted on his digital memory. Should the user smile at BOB while smashing his head against the floor, BOB may learn to associate pain with happiness. Over time, these memories build up and have the potential to shape each BOB’s unique identity. Both Perry and Cheng present contemporary experiences that feel deeply enmeshed in the now. Perry seems to capture a digital state of being for an entire race of people, drawing critical attention to the technological determinisms that obscure Black identity and squeeze productive value out of creative labor. 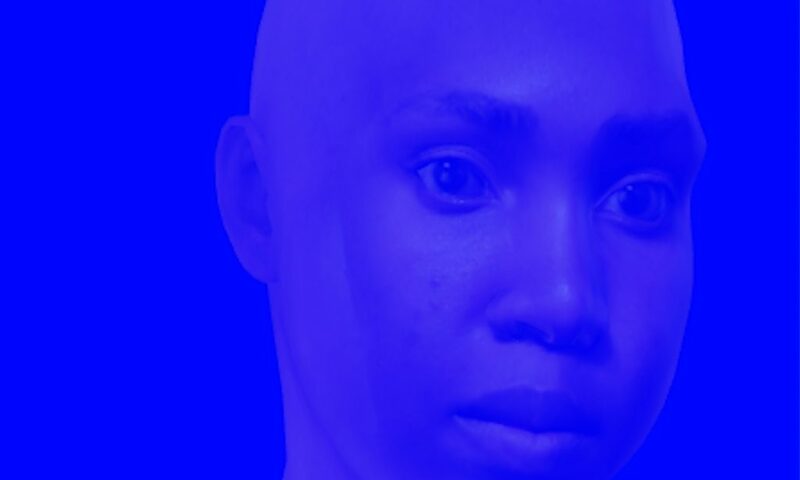 Her ability to link historical events in Black history to the current state of technological development unsettlingly reminds that there are inherent racisms encoded in digital materiality which connect to centuries worth of violence and degradation. Here, the term “algorithm” is true to its definition as a “process” or “set of procedures” that seek to suppress, oppress, and exploit rather than a neutral, rational mathematical formula. The aesthetics of machine vision on display here stake Perry’s claim that the white gaze has now extended into digital space. But, if Perry presents the problem Cheng perhaps presents a solution. BOB could be a metaphor for peaceful coexistence between humans and machines—a mutually beneficial zone of co-creation through digital presence that we are just at the cusp of understanding. Alternatively, BOB is a reminder that what we look at on screen looks back at us—a lesson that the seemingly infinite digital sphere is an environment like any other, one whose affordances and hostilities have dire ramifications for those who inhabit it. 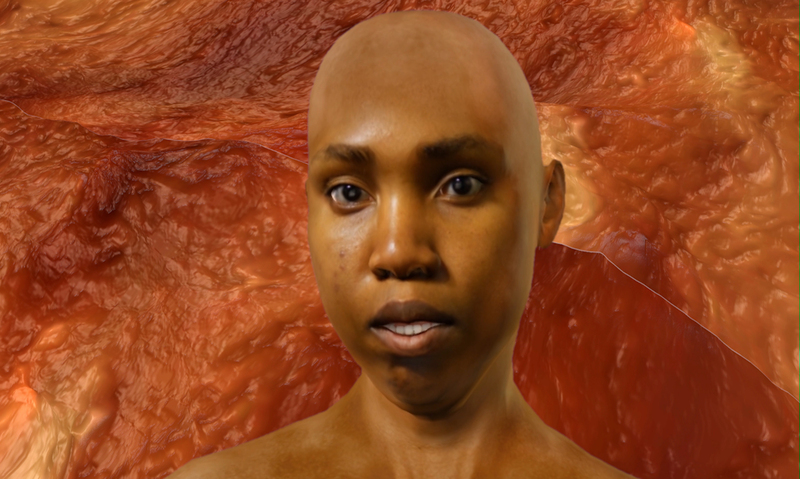 1Most notably in the video netherrrrrrrrrrrrrrrrrrrrrrrrrrrrrrrrrrrrrrrrrrrrrrrr 1.0.3 shown in the exhibition “Resident Evil” at The Kitchen in New York City in 2016. For more information, click here. 2For more on this, see Browne, Simone “Digital Epidermalization: Race, Identity, and Biometrics,” Critical Sociology, 36(1), pp. 131-150, 2009; Sweeney, Latanya “Discrimination in Online Ad Delivery” Communications of the ACM, 56(1) pp. 44-54, 2013; or Sandvig, Christian et al. “Automation, Algorithms, and Politics | When the Algorithm Itself is a Racist: Diagnosing Ethical Harm in the Basic Components of Software,” International Journal of Communication,10, 2016. 3Blender is an open source 3D rendering software. All of Perry’s work is made using freely available and open source material. She also makes all of her work available for view at sondraperry.com. 4For more on this, see Dean, Aria “Poor Meme, Rich Meme”, Real Life Magazine, 2016 [online], or Sharma, Sanjay “Black Twitter? Racial Hashtags, Networks and Contagion” New Formations, 78, pp. 46-64, 2013. In “Rich Meme Poor Meme,” Dean quotes a 2015 Pew Internet survey, which showed that nearly half of all Black Internet users use Instagram, whereas only a quarter of white users do. 5Dean, Aria “Poor Meme, Rich Meme,” Real Life Magazine, 2016 [online]. 6For more on this, see Doreen St. Felix, “Black Teens are Breaking the Internet and Seeing None of the Profit”, The Fader. 7Cheng admitted that part of BOB’s appearance was modeled after Nellie the singing Otter, #RIP. 8 Feedings occur twice daily at the Serpentine (or should I say Art Zoo) at 12:00 and 17:00.